Library reports that you own. Published in a folder from which you are authorized to access and view content. Shared in a folder from which you are authorized to access and view content. Note: To view a library report within a folder, the policy of the user on the folder or report must include the opLibrary security privilege. For more information, see the WebFOCUS Security and Administration manual. You may also be authorized to access and manage but not view the content of a Library report when you are authorized to manage the private content owned by other users. When a Library Report is created, it is assigned the same Title as the schedule. When the report is burst, the Library report Title is the burst value. In addition, the access level specified in the schedule is applied to the private Library reports. If the schedule specified a Library Access List, the private Library report will be shared with the groups and users specified in the Library Access List each time the report is distributed. Note: Even if you are a member of an Access List or the report is published, you can only view the output of a Library report you have been authorized to access as defined by WebFOCUS Client security. You can view the last, most recent version or view a specific Library report version from the tree or the ReportCaster Explorer. The options available for a Library report are based on the user authorization that is defined by WebFOCUS Client security. Only the owner of the Library report, users authorized to manage the private resources of another user, or users authorized to manage Library reports are authorized to delete the Library report. For additional information on WebFOCUS Client security, see the WebFOCUS Security and Administration manual. The tree provides access to Library reports from a multi-level folder organization. Library reports can be in the same folder as other ReportCaster or Managed Reporting content. However, it is a best practice for burst Library reports to be in their own folder so that all the burst report sections list together in the same folder. In addition, the Title assigned to each burst report is the data value of the burst field for that report section. The following image shows burst Library reports listed in the Regional Product Sales (Weekly Reports) folder. When a Library report is selected, the options available are determined by WebFOCUS Client security authorization. The following image shows the options available for the Product Packaging & Price Library report for a user that is authorized to view, delete, share, and manage its security. The View option View Last Version and Versions options allow a user to view the last, most recent version of the report or to obtain a list of all versions of the Library report. The following image shows the list of all versions available for the Product Packaging and Price Library report. From the Library Versions listing, you can view a Library report in a new window by selecting the version of the report and then selecting the Open option from the toolbar or the context menu. You can also view the report in the view pane, displayed to the right of the version listing, by selecting the Show View Pane toolbar option. The following image shows the Product Packaging and Price report displayed in the View pane. To hide the Library view pane, select the Hide View Pane toolbar option. The Hide View Pane toolbar option is highlighted when the view pane is displayed. The ReportCaster Explorer provides access to Library reports you are authorized to access. See the ReportCaster Explorer for information on the ReportCaster Explorer toolbar Filter and List folder options to list Library and Watch List reports with columns that provide information specific to Library reports. When a Library report is selected in the ReportCaster Explorer pane listing, you can click the Show version list pane icon to view the available versions of the report at the bottom of the dialog box. 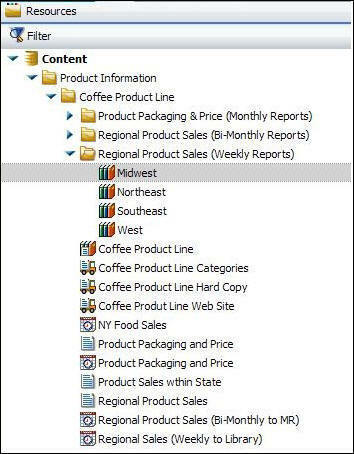 The following image shows the ReportCaster Explorer with the versions and options available for the Product Packaging and Price Library report. You can view the last, most recent version of the Library report by selecting the Open Last Version option, which will display the Library report in a new window. You can view a specific Library report version by selecting the report version in the pane below the Library report list. When a Library report version is selected, the Library report is displayed in the view pane to the right of the Library report list pane, as shown in the following image. To view a Library report version in a new window, double-click the report version or right-click the report version and select the Open option, as shown in the following image. The Library Watch List provides a quick and easy way to focus on information that is of interest to you by sending you an email when a new Library report version is available. You can add any Library report you are authorized to access to the Watch List, whether or not you own it. The Watch List email notification includes the report Title and a link to the report in the Report Library. Watch List email notification parameters are defined in the ReportCaster Server Console Configuration tab, under the Report Library folder. For more information, see ReportCaster Configuration. You can add or remove a Library report to the Watch List using the Subscribe and Unsubscribe options available when a Library report is selected from the tree or ReportCaster Explorer interface. The following examples show how to add a library report to your Watch List from the tree and the ReportCaster Explorer. In the tree, right-click the Library report that you want to add your Watch List and select Subscribe from the drop-down list. If the report is burst, subscribe to each report section you want to add to your Watch List. The following image shows the Subscribe option from the tree for the Product Packaging report. In the ReportCaster Explorer interface, select the Library Report Filter option located on the toolbar and the folder in the tree that contains the Library reports or is the folder path that the Library reports you are authorized to access are located in. The ReportCaster Explorer List Files options, located on the toolbar, allow you to view Library reports within the selected folder or within the selected folder and its subfolders. 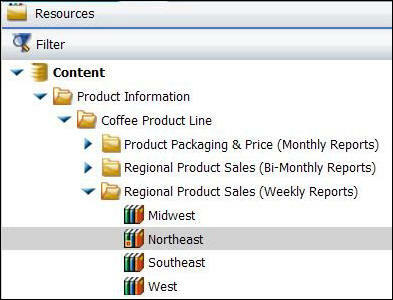 For more information on Filter and List Files toolbar options, see ReportCaster Explorer . Right-click the Library report you want to add to your Watch List and select Subscribe from the drop-down list. If the report is burst, subscribe to each report section you want to add to your Watch List. 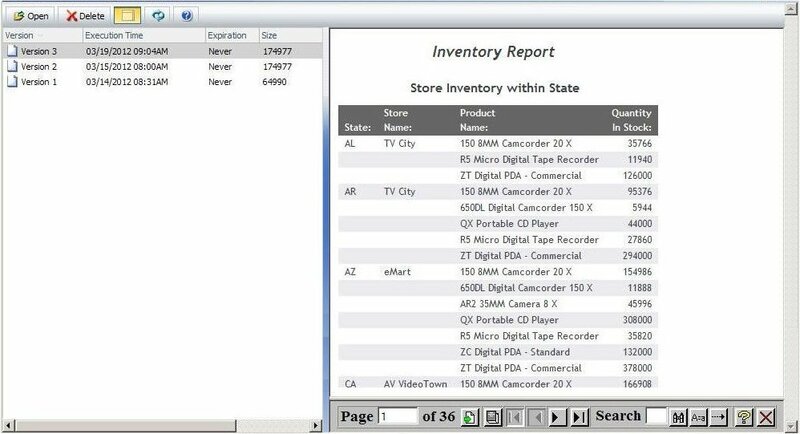 The following image shows the Subscribe option from the ReportCaster Explorer Library report list for the Northeast report section of the Retail Product Sales (Weekly Report). The following image shows the tree with the Regional Product Sales (Weekly Reports) folder expanded to list the burst report sections. The Northeast report section is a Watch List report. The ReportCaster Explorer Watch List Filter and List files toolbar options allow you to quickly and easily access Watch List reports within a single folder or within a folder path. For more information, see ReportCaster Explorer . When a Watch List report is selected, the report displays in a view pane to the right of the Watch List report list. To hide the View pane, select an empty area at the end of the Watch List report listing. You can also open the Watch List report in a separate window by right-clicking the Watch List report and selecting Open. Note: If you need to control when the View pane is displayed, access the Versions dialog box from the tree by right-clicking the Library or Watch List report you want to view and selecting View, then Versions. 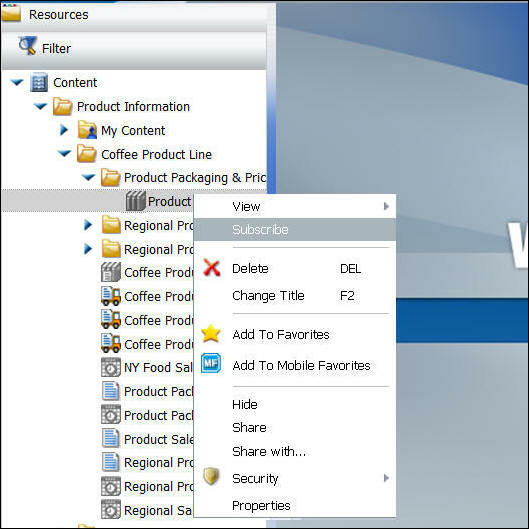 Use the Show View Pane icon located on the toolbar of the Versions dialog box to enable the display of the View pane. You can toggle to hide the View pane by clicking the Hide View Pane icon on the toolbar. In the tree, right-click the Watch List report and select Unsubscribe. In the ReportCaster Explorer Library or Watch List report listing, right-click the Watch List report and select Unsubscribe. Click Refresh to clear the Watch List report icon. Note: An administrator can unsubscribe other users from a library report. For Windows, this feature can be enabled by running the unsubscribe.bat file, located in the \ibi\WebFOCUS81\ReportCaster\bin directory. For UNIX, this feature can be enabled by running the unsubscribe shell script, located in the /ibi/WebFOCUS81/ReportCaster/bin directory. Authorized users can publish and unpublish Library Reports to make them available to users authorized to access the folder in which the Library Report is located. Publishing requires the folder in which the item is located to be published in order to publish an item within the folder. If the folder is subsequently unpublished, all items in that folder are unpublished. For more information on Publishing folders and items, see the WebFOCUS Security and Administration manual. Note: The My Content folder and the content within its folder path cannot be published. From the tree or ReportCaster Explorer, select the Library Report or folder that you want to publish. 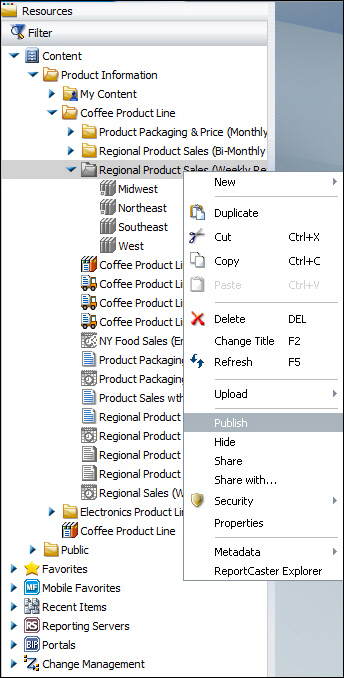 Right-click the item or folder and select Publish. The following image shows the Publish context menu option selected for an unpublished folder containing burst Library Reports. From the tree or ReportCaster Explorer, select the Library Report or folder that you want to unpublish. Right-click the published folder or item that you want to unpublish and select Unpublish. The following image shows the Unpublish context menu option selected for a published folder containing burst Library Reports. You can save a Library report to your machine using the Save As context menu option that is available when a Library report is selected from the Report Library Versions dialog box or the ReportCaster Explorer tree. The Save As context menu option downloads the Library report file to your machine. When the file is downloaded, the Windows File Download dialog box displays with the options to Open the file, Save the file, or Cancel the file download. The following image shows the file download for a PDF format Library report. The Name value displayed in the Windows File Download dialog box is the Library report name assigned when the report was distributed to the Report library. You can change the Name value and select the location in which to save the Library report in the Windows Save dialog box that displays when the File Download Save option is selected. From the BI Portal tree, select the Library report that you want to save to your machine. Right-click the Library report and select View, then Versions. In the Report Library Versions dialog box, right-click the Library report version you want to save and select Save As. The Windows File Download dialog box displays. The Windows Save dialog box displays, from which you can save the Library report to your machine. From the toolbar, click the Change your filter button and select Library Report. Note: You can also select Watch List if you have previously subscribed the Library report to your Watch List. Select the folder in which the Library report is located or select a folder on the path to the Library report and select the List files in selected folder and subfolders toolbar option. In the right pane, select the Library report you want to save to your machine. The versions of the Library report display in the pane below the Library report list. 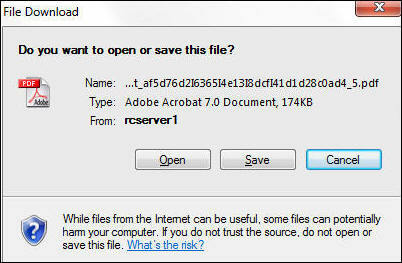 Right-click the report version you want to save to your machine and click Save As, as shown in the following image. To delete content from the Library, you must be the owner of the Library report or be authorized to manage Library content or the private content of other users. Deleting the Library report in the tree does not delete all versions of a Library report. The Library report displayed in the tree or ReportCaster Explorer Library report list is associated with the schedule that created the report or reports to provide you access to the Library report versions. Deleting the Library report in the tree will not allow users to access existing versions of the report or reports from the tree until the Library report associated with the schedule is recreated when the schedule that created the report or reports runs again and successfully distributes a new version of the report or reports. In the tree, right-click the Library or Watch List report and select the Versions option. In the ReportCaster Explorer, select Library Reports or Watch List Reports from the Filter toolbar option and in the tree, select the folder the Library report is located in. 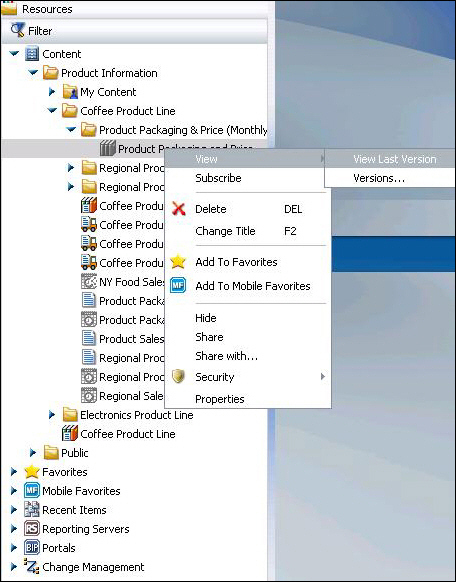 To list the files within the selected folder path, select the List files in selected folder and subfolders toolbar option. In the report list pane, select the report. The versions available for the selected report will display in a pane below the Library report list. Right-click the Library or Watch List report version you want to delete and select Delete. When you delete a version of a Library report, ReportCaster does not renumber the remaining versions. For example, if there are six versions of a report and you delete versions 1, 2, and 4, the remaining versions are 3, 5, and 6, and the next version of this report to be distributed to the library will be version 7. When all versions of a Library report are deleted, the Library report will continue to display in the tree, as it is the item associated with the schedule for future distributions of the report. All versions of the Library report (or reports) distributed by the schedule. Library report listed in the tree folder associated with the schedule. Delete the schedule associated with the Library report (or reports) If you do not want any future versions of the Library report to be created. The Report Library On-demand Paging feature enables you to view a report one page at a time from the Library while the web application server holds the remaining pages and feeds them at your request. This feature is useful for large reports because it decreases the amount of time you must wait before you can begin viewing the report. On-demand Paging reports open from the Library inside the WebFOCUS Viewer. This tool provides the framework to view report pages and allows you to search for specific pages or information in the report. To enable the On-demand Paging feature, the schedule that distributes the On-demand paging report to the Report Library must have the On-demand Paging format (HTML ODP) selected. Note: When HTML ODP is selected as the format, the Distribution Server adds SET WEBVIEWTARG=OFF to the procedure to control the behavior of the frames in the Library. SET WEBVIEWTARG does not override ON TABLE SET WEBVIEWTARG. Therefore, the scheduled procedure should not contain an ON TABLE SET WEBVIEWTARG statement with a target_frame value specified. See the Developing Reporting Applications manual for additional information on the WEBVIEWTARG command and other On-demand Paging settings. As with all Library reports, you can open the On-demand Paging report in a separate window or in the View pane from the Library Versions listing. For more information on viewing Library reports, see Viewing Library Content or ReportCaster Explorer . The following image is an example of an On-demand Paging report opened with the Library View pane. When viewing an On-demand Paging report from the Library Versions View Pane, the Web Viewer control panel is not fully visible and displays with a vertical scroll control. This can be resolved by viewing the On-demand Paging report in a new window by selecting the Open option from the toolbar or the context menu for the selected Library report, as shown in the following image. The WebFOCUS Viewer control panel, shown in the following image, appears at the bottom of the WebFOCUS Viewer. The controls enable you to display a specific page. To display a specific page, type a page number in the Page field and press Enter, or click the Go To icon next to the Page field and type in a page number. The following image shows the Page field and icon in the control panel. Display the previous or next page in a sequence by clicking the Previous and Next arrows, as shown in the following image. Display the first or last page of the report by clicking the First Page or Last Page arrows, as shown in the following image. Download the entire report to the browser as a single document by clicking the All Pages icon, as shown in the following image. Close the WebFOCUS Viewer by clicking the Close icon, as shown in the following image. You can email a Library report from within the Report Viewer. For more information, see How to Email a Library Report. Note: This feature is only available if IBI_Email_Reports is enabled in the WebFOCUS Administration Console. For more information on configuring this option, see the WebFOCUS Security and Administration manual. From the tree or the ReportCaster Explorer, open a Library report. Click the Send Report by Email icon, as shown in the following image. 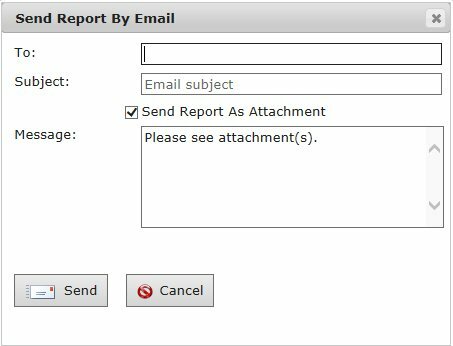 The Send Report by Email dialog box displays, as shown in the following image. To. Used to specify the email address of the recipients. This is required. Subject. Allows you to indicate a subject of the message. For example, the name of the report or the subject of the report being sent. This is optional. Send Report as Attachment. Allows you to send the report as an attachment or include the report in the email as an XML file. The default is to send the report as an attachment. This is optional. Note: If this option is disabled, the message field is deactivated. Message. Provides a text box into which you can enter information about the email. The default message is Please see attachment(s). This is optional.